Gorgeous sterling silver charm bracelet with lovely heart and cross charms on an adjustable sterling silver chain. Choose from two different sizes. Add a personalized, solid sterling silver heart charm added at the end of her bracelet. The custom engraving is beautiful and she will love seeing her name engraved, a truly precious gift she will always cherish! 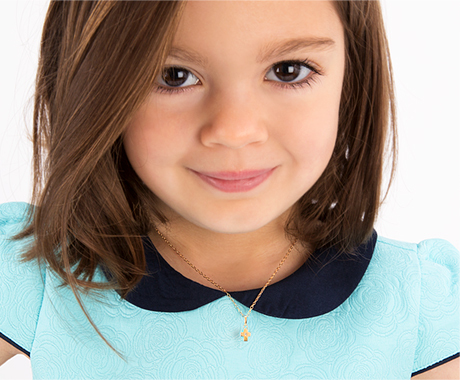 The charm bracelet was given to a little girl receiving her First Communion. She was pleased with the bracelet, and I placed it on her wrist immediately. I like the quality of the charm bracelet, and I plan to add charms to it in the future. The packaging was beautiful. I was proud to give this very special little girl a lovely piece of jewelry. This design was very beautiful and well made! I bought it for my God Daughter and everyone lived it. I've purchased baby gifts from Tiffany before and paid considerably more, but I was pleasantly surprised at the beauty and quality of the bracelet I purchased for my great niece's christening. Just lovely!